My family and I love to travel. Whether it’s visiting a theme park, lounging on a beach, or taking in natural wonders, we like to be comfortable when we travel. One of the main things I look for in a place to stay is a free breakfast. I’m not talking a continental breakfast of donuts and juice; I love a complete breakfast. Somewhere we can all get full before our adventures begin. Thick Belgian waffles are always our favorite food at a hotel free breakfast. You know the ones I’m talking about. They are light, fluffy, and delicious. Something about pouring the batter in and then flipping the handle makes the experience more enjoyable. I was so excited to find those same Belgian waffles with the flip option can be made at home! Even more exciting is the affordable price tag! Now we’re able to enjoy the hotel quality waffles even when we’re not on vacation. 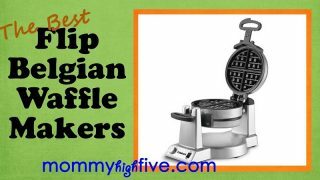 Here are my picks for best flip Belgian waffle makers. This is a fantastic waffle maker. 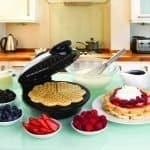 It is a flip machine that allows you to bake two waffles at the same time, which is something every mom can appreciate. The waffles are 1″ thick and 7″ in diameter. They come out delicious and evenly cooked. The waffles come out of the maker easily, and clean-up is quick and easy. Not only does this waffle maker come with two indicator lights, it also has three beep tones that alert you when each waffle is done. Additionally, there is a browning control knob, allowing you to make your waffles just the way you like them. The stainless steel exterior equals the superior quality of the interior. 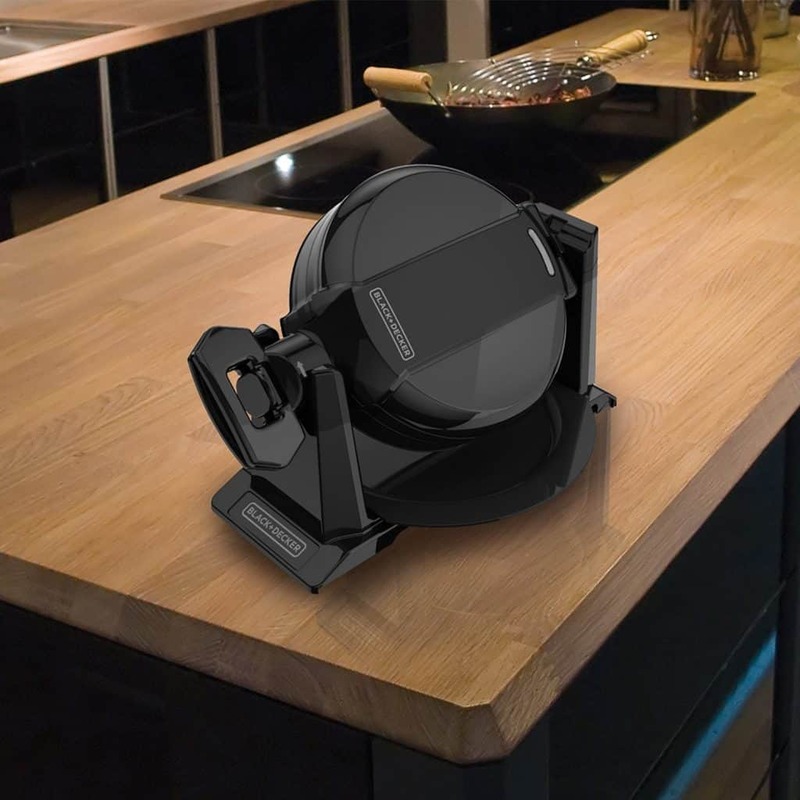 Unlike some other waffle makers, the Waring WMK600 comes with a one year warranty. I’ve tried many different waffle makers, and this one is hands-down my favorite! You won’t be disappointed with it. Cuisinart and Waring are sister companies, so the Cuisinart WAF-F20 Double Belgian Waffle Maker is very similar to the Waring WMK600 Double Belgian Waffle Maker. 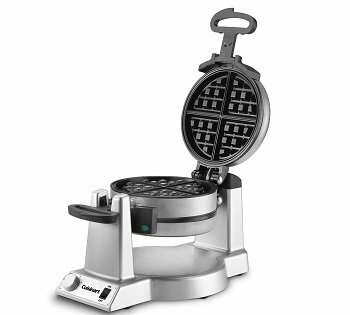 The Cuisinart model also cooks two waffles at once. 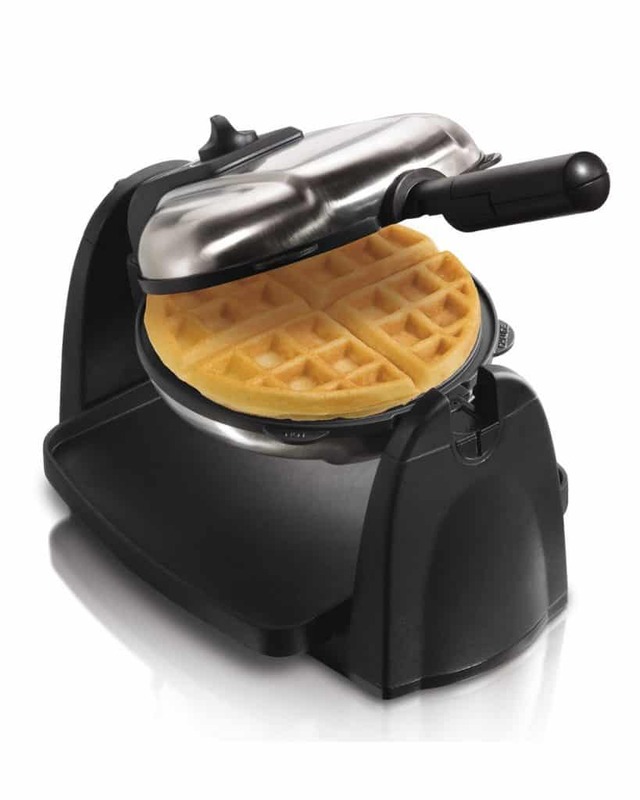 It has a browning control knob with 6 settings to ensure you’re getting your waffle just the way you want it. This machine is really good at keeping the waffles from sticking to the plates. Any spilled batter is easily wiped from the machine. The LED lights turn on and the machine beeps when each waffle is done. This is especially helpful when both waffles are cooking because each has a separate light to show you which one is done first. This is an economical choice for a flip Belgian waffle maker. It cooks one waffle at a time. Indicator lights tell you when it’s on as well as when it’s hot. However, there is no indicator to tell you when the waffles are done. 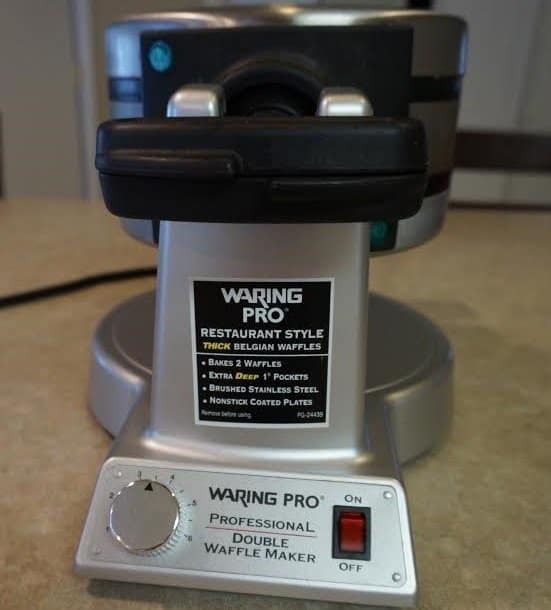 There is an adjustable browning control knob, but you have to use trial and error to figure out when your waffle is done. A nice feature about this waffle maker is the removable, dishwasher safe plates. It also comes with a drip tray. The handle folds to allow for easy storage. Finished waffles are 6 1/2″ in diameter and 7/8″ thick. This machine comes with a 1-year warranty. However, if you use the warranty you’ll have to pay the shipping charges. 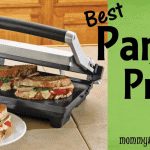 This is the least expensive double flip waffle maker on this list. While it does a great job at its price point, I do have a few criticisms. This machine makes waffles that are 6 1/2″ in diameter and about 1″ thick. Cool-touch handles ensure you will not burn your hands while opening, closing, and flipping the machine. There are a few down sides to this machine. Although the plates are advertised as being non-stick, the owner’s manual says to apply canola oil before each use. If you don’t apply canola oil before each use, you’ll end up with torn, stuck-on waffles. Also, there aren’t lights to indicate when the machine is hot enough or when the waffles are done cooking. There’s no temperature control, either. It comes with a 2-year limited warranty. If you don’t apply canola oil before each use, you’ll end up with torn, stuck-on waffles. There are not lights to indicate when the machine is hot enough or when the waffles are done cooking. There is no temperature control, either. The Black and Decker WMD200B comes with a 2-year limited warranty. At a midlevel price point, this waffle maker is slightly different in design than the others on this list. Rather than twisting the handle to flip the machine, this machine requires you to flip the entire machine from one side to the other. The resulting waffle is 7 inches in diameter, which is as big as any on this list. Additionally, this machine can be stored vertically, which saves on storage space. Most of the other machines on this list are quite bulky. The stainless steel exterior and the Teflon coated plates make this a nice looking machine. However, there are some drawbacks. There is a timer for this machine to tell you when your waffles are done, but the timer is on its own battery. That means it cannot sense when the waffles are done. You’ll likely end up with raw or burned waffles until you figure out exactly how much time is needed. Also, after several uses even using nonstick spray does not keep the batter from sticking. The manufacturer has a 1-year warranty on this product. 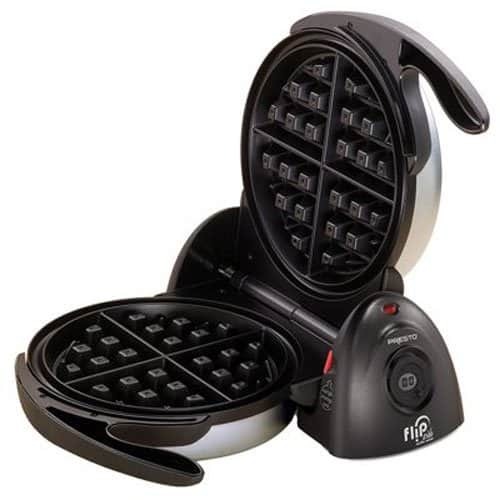 As you can see, there are several options and different price points for flip waffle makers. If you’re looking for a great machine that will last the test of time and give you the delicious waffles you want, I recommend going with the Waring WMK600 Double Belgian Waffle Maker or the Cuisinart WAF-F20 Double Belgian Waffle Maker. They come with all the bells and whistles (well, lights and beeps). You won’t be disappointed with these machines, and you will feel as though you’re on vacation enjoying a delicious waffle breakfast! 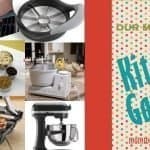 Want to know more about waffle makers? 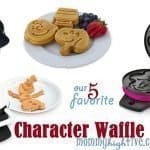 Be sure to take a look at our budget traditional waffle makers as well as character waffle maker reviews.